Checked cloths were evident in many early cultures, however, the term plaid drives from Scottish Celtic culture of around the sixteenth and seventeenth centuries (Bonfante 1975; Barber 1991; Cheape 1995). The popularity of checked cloths in North America and the use of the word plaid to describe these cloths are almost certainly linked to the influence of Scottish immigrants from the late eighteenth century onward. The term is widely used in North America to describe a diverse range of checked cloths from heavy tartans and tweeds to fresh cotton ginghams. However, within Britain, plaid generally refers to either tartan or checked cloths similar to tartan. 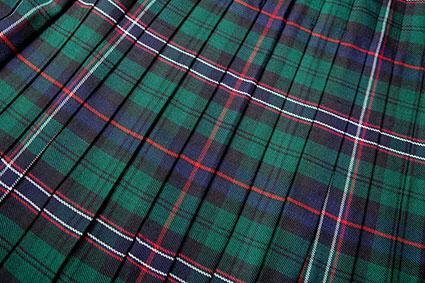 It also signifies a length of tartan cloth worn over the shoulder as part of the more elaborate forms of Highland Dress. In the early Celtic culture of Scotland and Ireland, a type of shaped cloak known as a mantle was worn. In the sixteenth and seventeenth centuries, this developed into the simple, untailored length of cloth known as the plaid. Cheape further identifies that "plaids or plaiding were Scots terms used to describe the relatively coarse woven twilled cloth that might be used, for example, for bed coverings as well as garments" (p. 19). Indeed the Gaelic meaning for the word plaide is blanket, whereas the plaid as a garment tends to be referred to as a breacan, the belted plaid, which was commonly worn by men in Highland Scotland. Women throughout Scotland wore the plaid as a large tartan shawl, a style that was popular until the mid-eighteenth century (Dunbar 1981, p. 125; Cheape 1995, pp. 3-20). "Many wear (especially of the meaner sort) plaids, which is a garment of the same woollen stuff whereof saddle cloths in England are made, which is cast over their heads, and covers their faces on both sides, and would reach almost to the ground, but that they pluck them up, and wear them cast under their arms. (Cheape, p. 19) "
By the early nineteenth century, plaids in their original form were scarcely worn, though; in that era plaid cloth gained an international profile as a fashion textile. American mail-order catalogs from the nineteenth century indicate that plaids were popular for men's work-wear and day wear, and for making women and children's dresses and blouses (Israel 1976; Kidwell and Christman 1974, p. 58). The colorful, geometric designs concerned have become embraced within modern, sporting, or "homely pioneer" notions of American sartorial identity. This is linked to the fact that plaid shirts and jackets form part of the image of American male stereotypes such as lumberjacks and frontiersmen. It is also connected to the influential work of American sportswear designers like Claire McCardell and Mildred Orrick, who frequently used plaids in their designs of the mid-twentieth century (Milbank 1989; Yohannan and Nolf 1998). The embrace of plaid within American culture has influenced subsequent reinterpretations of it. For example, plaid has featured in cowboy, and work wear-inspired gay styles of the 1970s onward, as well as in the subcultural styles of skinheads, rockabillies, and punks. Plaid has also featured consistently in international designer collections, particularly since the 1970s. See also Scottish Dress; Tartan. Barber, E. J. W. Prehistoric Textiles: The Development of Cloth in the Neolithic and Bronze Ages, with Special Reference to the Aegean. Princeton, N.J.: Princeton University Press, 1991. Bonfante, Larissa. Etruscan Dress. Baltimore: Johns Hopkins University Press, 1976. Cheape, Hugh. Tartan: The Highland Habit. Edinburgh: National Museums of Scotland, 1995. Dunbar, J. Telfer. The Costume of Scotland. London: B.T. Batsford, Ltd., 1981. Israel, Fred. 1897 Sears Roebuck Catalogue. New York: Chelsea House Publishers, 1976. Kidwell, C., and M. Christman, eds. Suiting Everyone: The Democratization of Clothing in America. Washington D.C.: Smithsonian Institution Press, 1974. Milbank, Caroline Reynolds. New York Fashion: The Evolution of American Style. New York: Harry N. Abrams, 1989.